Can Germany’s renowned beer capital deliver anything as good as the American craft beer movement is brewing? New Town Hall in Munich’s Marienplatz. I’M BARELY THROUGH BAGGAGE CLAIM before I enjoy my first taste of German craft beer. Munich Airport is, fittingly, the only airport in Europe with a microbrewery inside the terminal, serving freshly brewed beer in an enormous glassed-in biergarten. At the entrance, I meet braumeister Rene Jacobsen, who walks me back into the brewing operation, past a large, silver mash tun emanating the sweet smell of fermenting barley malt. 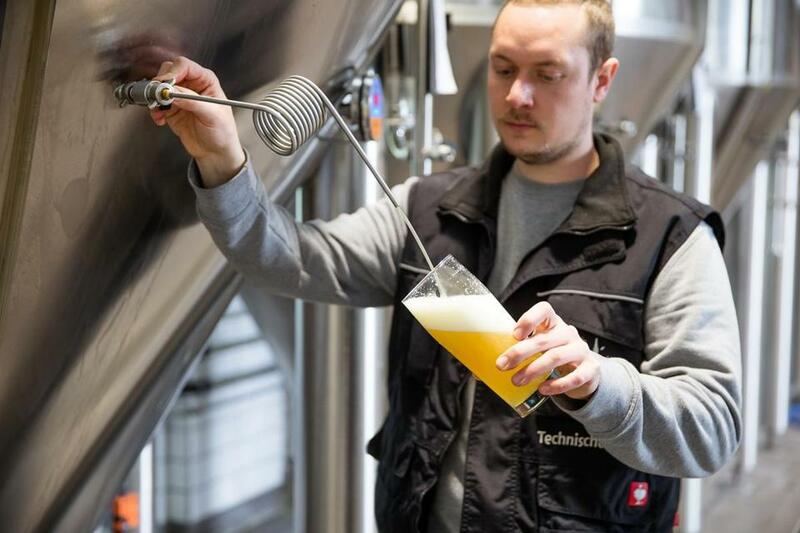 He serves all of his beer unfiltered, says Jacobsen, who prides himself on the quality of his ingredients, including the noble aroma hops grown nearby in the Hallertau region. Due to the heavy traffic in the terminal, as well as a healthy complement of locals, none of it stays around more than three or four days. Jacobsen pours out a mugful of the popular Jetstream Pilsener, pale gold and cloudy in the glass. I lift it to my lips with anticipation and taste: Budweiser. But the freshest, cleanest Budweiser I’ve ever had. It might be fine to drink after lawn mowing or during an all-day music festival, but it’s nothing close to an American craft beer. Confession time: I have never loved German beer. 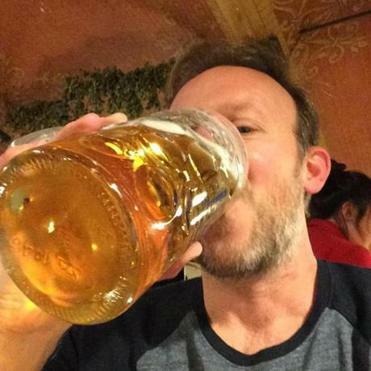 I know, I know, it’s supposed to be the best in the world and all that, attested to by the 5 million-some pilgrims who descend upon Munich every autumn to celebrate the beverage in a riot of brimming steins and lederhosen. But to me, it’s always seemed a bit, well, boring. Beer snob? Guilty as charged. Give me a West Coast IPA with a piney nose and a solid malty backbone, and I’m in heaven. But I’m left cold by the dull triumvirate of Pilsener, Weiss, and Dunkel that dominates every bar in Germany. But something has been stirring in Deutschland of late. As beer consumption has actually gone down a third in the past 25 years, drinkers across the country, especially in the more progressive northern cities of Berlin and Hamburg, have increasingly turned to American-style craft beers as a more flavorful alternative. 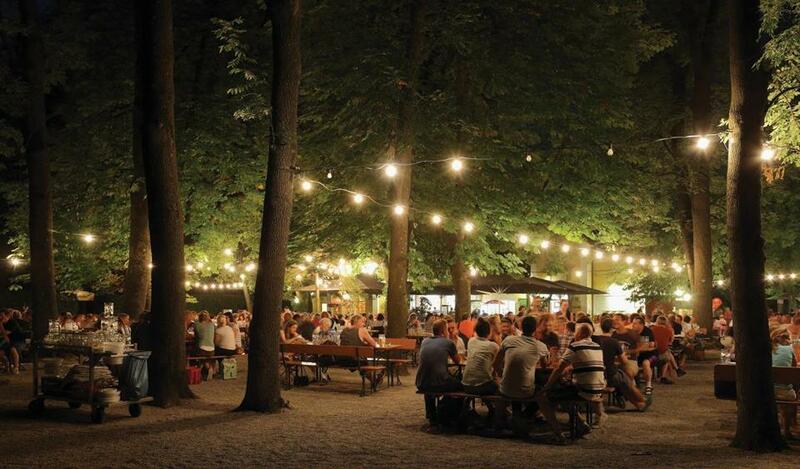 Now here I was in the World Capital of Beer, Munich — where the history of beer goes back a millennium and tradition dies hard — to find out just how far craft beer has come. And to see if I can find a decent IPA. On the way in from the airport, my cabdriver, Max, sums up my thoughts perfectly. “There is no bad beer in Germany,” he says. “There are cheap beers that don’t taste the best.” As we drive toward the city center, he points to a distant hill and Weihenstephan, the oldest continuously operated brewery in the world, founded by Benedictine monks in 1040. Compared with flashier Napa, the feeling is more laid-back in Sonoma — the perfect place to learn a little something while you sip. The first state “beer purity law,” or Reinheitsgebot, was passed 500 years ago this spring. It was 1516, and Bavaria — the German state of which Munich is the capital — declared that beer could only be made with three ingredients: barley malt, hops, and water (later modified to include yeast and wheat malt). It was originally passed as a health measure, Max tells me, but it also had the effect of making Bavarian beer taste better than any other beer around. As similar regulations have been relaxed across Germany, Bavaria has proudly held onto its mandate — making it illegal to put the label “bier” on anything brewed with other ingredients (a coffee porter or a fruity Belgian lambic, say). By the time the Oktoberfest started as a royal wedding feast in 1810, there were more than 70 breweries within the city limits. Now there are the “Big Six” — Lowenbrau, Spaten, Paulaner, Hacker-Pschorr, Hofbrau, and Augustiner. While Hofbrau is owned by the Bavarian state, only Augustiner is privately owned. Munich residents choose their beers like sports teams, drinking the same brews their grandfathers and their great-grandfathers drank. Max, like many locals I meet, prefers Augustiner, perhaps out of a sense of local pride. When I get into the city, I eschew the touristy Hofbrauhaus in favor of Augustiner Braustuben, the kind of beer hall you read about, with row after row of wooden tables served by ruddy waitresses clad in plaid skirts and blouses with white frilly decolletage and clutching fistfuls of comically giant glass beer steins. Called a maß (pronounced “mahs”), each glass carries a full liter of beer, which in Munich usually means Helles lager, a style lighter and less bitter than Pilsener but similarly low in alcohol. I order a flagship Augustiner Edelstoff, taking a selfie like every other tourist as I hoist a glass the size of my head. The beer inside is clean, fresh, cold, good — and plain. It’s designed well for a brew that you can sit and drink all day from giant glasses — but taste? Not so much. Braumeister Simon Rossmann draws a beer at Giesinger Brau, which started in a garage and is now Munich’s largest craft brewer. THE NEXT MORNING, I AWAKE (relatively) fresh with renewed dedication to my quest. 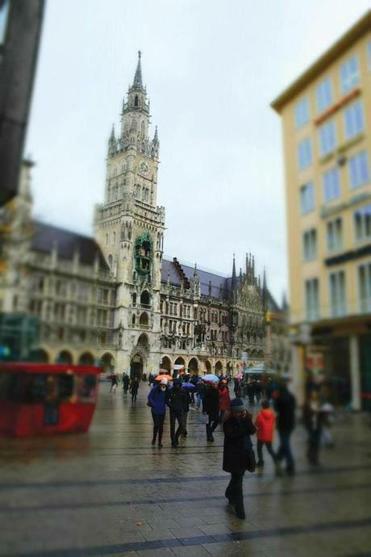 I start with a jaunt to Munich’s central plaza, Marienplatz, dominated by the New Town Hall, or Neues Rathaus — a confection of Gothic Revival spires and arches that houses Munich’s famous glockenspiel, a huge mechanical wonder, which shows just how inextricably beer is linked with the history and social life of the city. Every day at 11, tourists gather in the plaza to watch animated figures enact a joust and wedding celebration in honor of Duke Wilhelm V, founder of the famous Hofbrauhaus. It’s followed by another tableau of beer-barrel makers performing a dance dating back as far as the beer purity law itself. Just a few blocks away, the Bier und Oktoberfestmuseum displays a holy relic of the “Guild Ark of Munich Brewer’s” — a 17th-century chest that’s hauled to the city’s cathedral every May to be blessed to ensure the quality of the year’s brews. When he retired, he decided to test that sentiment. Now Sam Adams and Sierra Nevada sit on the shelves of his store next to German lagers and Belgian fruit beers. It’s still an uphill climb to persuade older customers, he tells me. “They’ve been drinking their Augustiner Helles for 40 years and see this latest dry-hopped fruit beer as the latest hype,” he says. Still, business has steadily increased in the nearly two years since he opened, especially with drinkers in their 30s and 40s who are looking for something new and don’t mind spending a little extra for it. Especially as the major Munich brewers have been acquired by foreign corporations (Lowenbrau and Spaten are now owned by Anheuser-Busch/InBev, and Paulaner and Hacker-Pschorr by Heineken), beer drinkers have begun to whisper that quality has gone down, encouraging them to look beyond their grandfather’s drink, Thieme says. Matthias Thieme is the owner of Biervana, one of only two stores in Munich that specialize in craft beer. 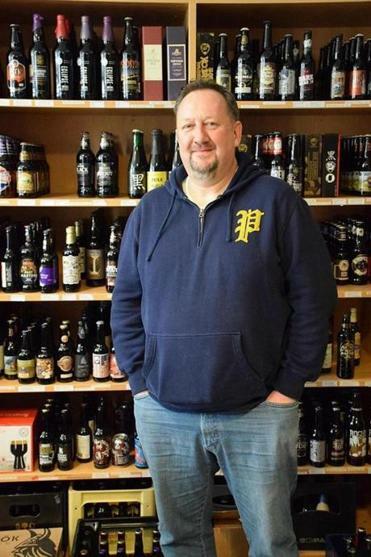 While many of the German craft brews he sells are from the north, he carries beers from four Munich craft brewers. One of the first, CREW Republic, calls its people “beer rebels,” brewing styles from IPA to Imperial Stout (even though the labels tout that they brew according to the purity law). The largest craft brewer, Giesinger, began with more traditional styles before lately branching out into more creative recipes. Eiswerk, meanwhile, is a boutique division of beer giant Paulaner. The last Munich craft brewer, Tilman’s, doesn’t have its own plant; rather, it’s the personal project of a “gypsy brewer,” Tilman Ludwig, born and bred in Munich, who makes a traditional Helles beer, but dry-hopped with aroma hops from the Yakima Valley in Washington, giving it a fragrant, fruity overlay reminiscent of a pale ale. I buy a bottle and have to admit that while it’s still a bit watery, it’s more flavorful and complex than any of the beer I’ve had so far in Munich. If I was going to drink a Helles beer, this is what I’d drink. As a point of comparison, Rossmann pops open a bottle and pours a dark, thick rye porter, which uses five different malts to produce a unique taste — chocolatey and velvety, with a zippy spice from the rye. Just as good in a completely different way is a Lemondrop Triple, a strong Belgian-style beer that combines the traditional funk of Belgian yeast with a blast of citrus from a new aroma hop from the United States. It’s as fruity as you can get without actual fruit. Less than a 15-minute walk up the street from Giesinger, in the shadow of the enormous Paulaner brewery, is Brauerei im Eiswerk (pronounced “ice-verk”), which started four years ago as a pilot operation to demonstrate brewing techniques to its sales team. The beer was so good, the company decided to start bottling it, says Martin Zuber, who now heads the operation, which he insists is independent of his parent company. “I am completely free,” he says. “If I am taking a shower in the morning and think of a new beer style, I can do it.” In addition to a small brewpub open by appointment, Eiswerk distributes its beer every other Wednesday, by reservation, and partners with the Westin Grand hotel downtown to offer it on tap. In addition to a fresh malty Marzen, and woodsy Comet, named after the bitter Comet hop, Eiswerk has experimented with stronger beers — including Bourbon-Bock3, a triple bock aged three months in American whiskey barrels, a dark, syrupy beer with hints of vanilla and caramel, clocking in at more than 9 percent alcohol. After drinking diligently all afternoon, I don’t dare try the Eisbock, a 22 percent brew sealed with wax in small bottles. 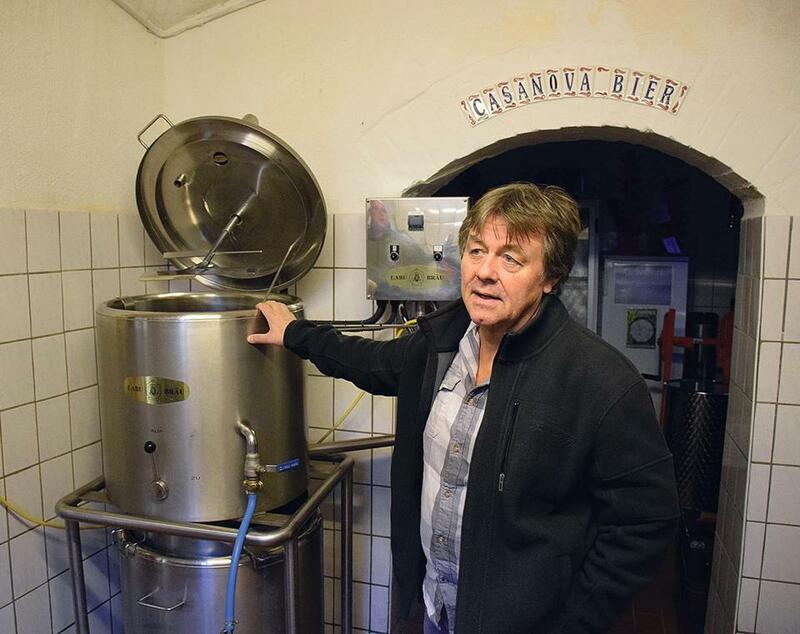 Gunther Baumann in his basement brewpub, Richelbrau, located in Neuehausen, a residential area of Munich. THAT NIGHT, I PAIR SOME FOOD with my beer at Red Hot, a bona fide BBQ joint and one of the few places in town to proudly tout the fact that it serves craft beer. The interior is warm and inviting, with students from the nearby university crowded around wooden tables and nestled up to a long copper bar. I pair a juicy pulled pork sandwich with a Drunken Sailor IPA from Crew Republic, a creamy, bitter ale that is solid if uninspiring. There is something a bit romantic about squeezing down the cramped hallway and a tight set of stairs to get to Baumann’s makeshift basement brewpub, where two beer kettles sit among a sink and kitchen implements and a row of tables and benches. In the back is a small beer museum, along with a movie room to show films (most about either beer or Casanova), and even a B & B for overnight guests. Technically, Richelbrau isn’t licensed to sell its beer, so tastings are offered “by donation.” Every Saturday, visitors are invited down to sample Richelbrau’s latest experimental brews, which are made by a rotating cast of a dozen or so beer hobbyists who use the equipment. Baumann starts by pouring me a dunkelweizen, a dark wheat beer with a heavy helping of caramel malts that is lip-smacking good. But my hopes especially rise when I see a keg in the refrigerator labeled with masking tape reading “extreme hops.” The beer, he tells me, was created by a pair of expat Americans, Bob Leonard and Tim Bueschen, dispensing it with a trickle into a glass. A heady froth builds gradually, coalescing into a bright amber liquid. I raise the glass to my lips, inhaling the hoppy aroma as I taste. And I realize that at last I’ve found what I came here for — my palate explodes with aromatic pine with undercurrents of pineapple and passion fruit, all washed down with a crisp malty finish. Maybe it takes Americans to make a good German beer, I muse. But I keep that thought to myself, replacing it with another: Maybe I do like German beer, after all. 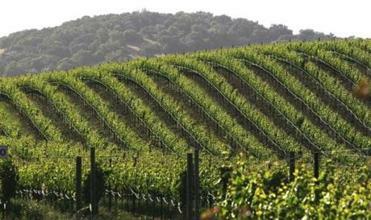 ■ A down-to-earth wine tour in Sonoma Valley. ■ Top-notch whiskey and world-class thoroughbreds in Lexington, Ky.
■ New England’s best summer festivals for food and drink. This story has been updated to clarify Munich’s role in beer history and correct an error about the companies Heineken owns.